Looking for a scary Halloween costume that won't break the bank? 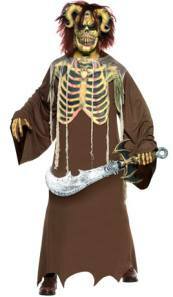 Then how about this Skeleton King Fancy Dress Costume. This grim skeleton warrior with detailed horns, hair and rib cage, gives you a lot of costume for the price and is ideal for Halloween. The outfit includes a long brown robe with flared sleeves, tatty hem and attached 3D moulded rib cage. The robe simply pulls on over the head and Velcros up at the back. A separate gauze shoulder piece is then worn over the shoulders. The detailed mask includes a hand painted skeleton face, chains coming from the side of the head and twisted horns with 3D spikes. Covering the front of the face the mask also has an incorporated wig with fiery brown crimp. This is a one size item designed to fit most adults. It was £39.99 but has just been reduced to £27.99 online.